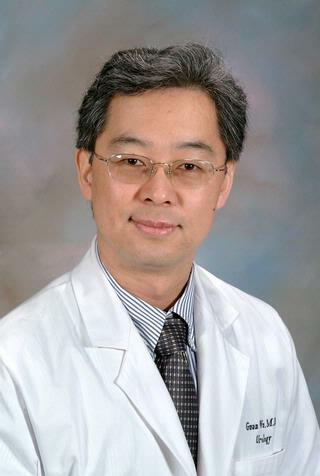 We are pleased to welcome Guan Wu, MD, PhD to the Department of Urology at the University of Rochester Medical Center. Dr. Wu has joined our growing research and clinical faculty, extending our knowledge and our ability to offer our patients the best care possible. Dr. Wu has been working on identifying and characterizing biochemical defects in kidney cancer cells. His laboratory is also analyzing the genetics of human kidney cancer specimens, specifically to identify tumor markers. Dr. Wu is performing minimally invasive and robotic surgery and also sees general urology patients in our offices in Canandaigua, Clifton Springs and Rochester. He specializes in laparoscopic surgery, general urology and kidney cancer research. 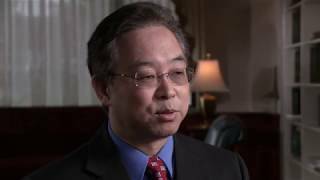 Dr. Wu is a double doctorate graduate of the Beijing Medical University School of Medicine. He also completed his post-doctoral training at the University of Iowa Hospital and Strong Memorial Hospital. His dual residencies allow him to see surgical urology patients. The long-term goal of Dr. Wu's research is to refine our knowledge of the biology of kidney cancer. Currently, Dr. Wu's laboratory is studying genetic defects in kidney cancer cells and how these defects cause the disease. Dr. Wu's laboratory has been working on the proteins produced by cancer critical genes. He and his associates are learning how the cellular and biochemical functions of these proteins cause kidney cancer to develop and progress. Dr. Wu's laboratory has identified several such complexes by purifying them from kidney cancer cell lines and by using yeast as a human protein carrier. This research is not only extending our understanding of kidney cancer, but also has broader implications for normal cell physiology. Dr. Wu's laboratory is also analyzing the genetics of human kidney cancer specimens to look into DNA mutations. This research will be combined with the studies done with kidney cancer cell lines. Together, they will help us discover and validate new "tumor markers" (substances produced by the body that can indicate the presence of a specific cancer). This, in turn, will help us develop new ways to diagnose and treat kidney cancer. Kukreja J, Levey HR, Scosyrev E, Kiernan M, Berrondo C, McNamee C, Wu G, Joseph J, Ghazi A, Rashid H, Dozier A, Messing EM. "Effectiveness and safety of extended duration prophylaxis for venous thromboembolism in major urologic oncology surgery". Uro Oncol. 2015; 3(9):387. Gellhaus, P,Rilly C, Llukani E, Lee Z, Rashid H, Ghazi, A, Joseph J, Wu G, Eun D, Boris R. "Robotic management of genito-urinary injuries from obstetrical and gynecological operations: a multi-institutional report of outcomes". BJU Int. 2015; 115(3):430-6. Agrawal V, Kucherov V, Bendana E, Joseph J, Rashid H, Wu G. "Robot-assisted laparoscopic repair of vesicovaginal fistulas-a single center experience in 10 patients". Urology. 2015; 86(2):276-82.